If you had to pick ONE pastry/bread/muffin/donut/sweet starter that is 'traditional' or well-loved in your neck of the woods, what would that be? Something you either introduce your guests to or something they expect to have, that sort of thing. Limit it to something you would serve for breakfast rather than a 'pie' unless you serve pie for breakfast! Our breakfast starts our day, So it should be healthy enough to give a good start to our day. I would suggest you to eat fruit salad of different type that will keep you light whole day as well as refreshing. I used to make fruit crisps in the cold months - very traditionally deep South, like a Brown Betty. Peach, cherry, blueberry, etc. Ha Ha. According to my mom, Pie and coffee was the best possible breakfast! Scones are probably the most common sweet available locally for breakfast, but no real regional standard here. Ha Ha. According to my mom, Pie and coffee was the best possible breakfast. I agree with your Mom 100% and so do my kids! It's my personal favorite breakfast. But I wouldn't serve it to my guests for breakfast. My guests seem to LOVE it when I serve Cinnamon rolls with breakfast. Leftover birthday cake.... the best breakfast ever! I served apple and pumpkin pie for the day after Thanksgiving breakfast. Anadama Bread. The story is that it was invented on this island. There used to be a factory in this town that made it. Now it is only made by local bakers. It's a heavy molasses bread. We buy the frozen dough from a local baker and bake it the morning we serve it. From Wikipedia: It is not readily agreed exactly when or where the bread originated, except it existed before 1850 in Rockport, Massachusetts. It is thought to have come from the local fishing community, but it may have come through the Finnish community of local stonecutters. Near the turn of the 20th century, it was baked by a man named Baker Knowlton on King Street in Rockport, Massachusetts and delivered in a horse-drawn cart to households by men in blue smocks. In the 1940s, a Rockport restaurant owned by Bill and Melissa Smith called The Blacksmith Shop on Mt. Pleasant St. started baking the bread for their restaurant in a small bakery on Main St. They baked about 80 loaves a day until 1956, when they built a modern $250,000 bakery on Pooles Lane. They had 70 employees and 40 trucks which delivered Anadama bread all over New England. The Anadama bread center of consumption was in Rockport and next-door Gloucester, Massachusetts. It was commercially available from local bakeries widely on Cape Ann from the early 1900s until 1970, when the Anadama Bread Bakery on Pooles Lane in Rockport closed due to Bill Smith's death. For a number of years, it was baked by small local bakeries at breakfast places on Cape Ann. Yup, Anadama bread is common down here as well. In fact, I have some rising in a bowl by the stove as we speak! We are expecting a winter blizzard to night so I've got a pot of pea soup and Anadama bread in the works. Thinking of all of you in the storm's path...be safe. We just have a few flurries and that is really all that is expected here. Up to 16" expected here. And wicked cold temps. My daughter in Chicago said they have 15 inches. She is hoping it has stopped. I just hope it is enough to keep the cruds off the streets - but then if they are cooped up, she gets the domestics and they can be more dangerous. Interesting innkeeper story. had a call from a neighbor to see if we have a generator and vacancy. She is planning to come here for a room if she loses power! Answers were yes and yes. The generator won't give them light, but it will power the oil burner. And we have lots of lanterns. Expecting 15 or so inches. Winds are picking up. Don't expect damage, just lots of snow and wind. The other are beignets which are deep fried and oh so yummy. I don't deep fry anything, besides they are best at THE coffee place in big city! I tell everyone that is a must! Mostly I serve biscuits with jam or honey or fruit/cream cheese croissants. I had dropped making the muffins for the most part except for early departures. Well we start the 'parties' on Day of Epiphany and continue to MG day. Our king cakes are a little different than what you picture but we do put a 'baby' inside the cake. Here, it stands for the baby Jesus. The person 'lucky' enough to get the baby hosts the next king cake party! Most are cinnamon but the best are filled with cream cheese and or fruit (gelled). What Americans call a chocolate croissant, but we would NEVER call it that, since it's not shaped like a crescent. What is a chocolate croissant? 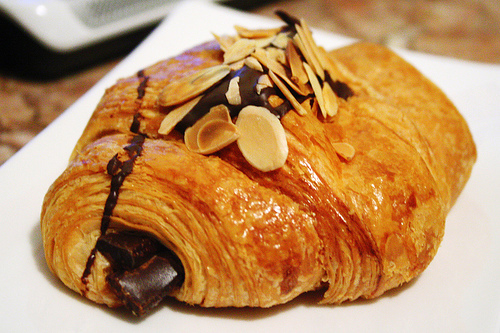 We have chocolatine, which the French also call "Pain au chocolat". It is two to three bars of chocolate in a rolled up dough. Now that DOES resemble a sausage roll from down under (one of the variations of them) definitely not chocolate. At the bakeries in Oz there are almond croissants, filled with some sort of rum butter cream or something, and icing sugar all over them, and all over you when you eat them. Almond croissant come in two types. The normal ones are regular croissant with pate d'amande (almond paste) inside and a few almonds on top and icing sugar. And then there is a harder variation, that is more cookie danish like, but I havn't been able to find a recipe to make my own. Leave it to Sugar to try to rope us Yanks into this one! I have never even seen those before in my life. Look at the top picture, you can see the sad puppy dog face with two droopy eyes. The list had them in most States but not in WV yet. First and last one I ever saw was in DC. I do know it's a chain, just haven't seen one in 20 years. I remember it because DH & I were on our first trip together. We were walking around DC and decided to stop and get a coffee. We ate outside at one of their tables while homeless people slept on the grates or sat and watched us. My first was in 1986 in Boston near the Back Bay Hilton. A manager at the hotel I was working at got me a room there for $35 per night. It was one of the placves we stayed with 2 beds and the girls og the bed one night and the boys got it the next - off nights got the floor in sleeping bags. That is how we were able to take the kids all over the US, even to places we did not have friends or family to stop over with. I don't know about SB, but around here it would be pain chocolat. Pain means bread. Croissant dough rolled around either a sheet of chocolate or a chocolate filling. Baked into a rectangular shaped pastry a bit bigger than a deck of cards, drizzled with more chocolate and dusted with powdered sugar. Divine! We had those in Boston in 1986 at a place called (can't remember) Au Pain. Oh they were soooo good!! I never heard of that either, but I want one! Speaking earlier of fried pies, I was raised on them, apricot ones and apple ones, until my mother decided they were too much trouble to make. These days I get them once a year, when the Humane Society ladies make them as a fund raiser. A restaurant near here is famous for their chocolate fried pies, with a filling something like Nutella rather than a fruit pie filling, and they are good, but not really traditional around here like the peach, apricot, and apple ones (that's 3 separate pies, not mixed into 1 pie). The home made fried pies I had came from dried, then reconstituted apricots. Is that the way your mom made them? Yep. From dried apricots. My mouth is watering. I honestly cannot think of a breakfast sweet that is regional here. Not having grown up in this area is part of the problem and having a "split" childhood is the other. I grew up in West Virginia with a Chicago Mother - I could not win if I tried! My Mom baked a lot but breakfasts were basic - sweets were cookies, cobblers, klotchkes, cakes, etc. Sometimes she would make cinnamon/raisin rolls. Mostly in winter it would be cooked hot cereal that was cheap to do and summer it would be corn flakes - although I started many a day whacking off a big slice of her homemade bread that I then slathered with ketchup. Just asked a friend who grew up here and he said they had pie for breakfast sometimes. Pancakes with lots of syrup would be a sweet breakfast. We don't have a specific item that's from here, but if it's got butter, cheese, yogurt, or anything else dairy it's our regional dish! Bake a batch of homemade biscuits (or Pillsbury and Great Value also sell great ones frozen that bake up perfect in about 20 minutes). No canned biscuits, please! Pour about 2 tbs sorghum molasses into your plate then stir about 1 tbs butter into it. Eat it with the hot biscuit. Repeat until you cannot hold any more. That's how the locals eat it but of course you could butter the biscuit, pour the sorghum on top like pancake syrup, and dig in with a fork, but then locals would cast suspicious eyes your way. In North Georgia the orchard we visited made fried pies. Now, that is a regional dish that could be served. We all had samples. Dee-lish. Home-made is roll out a biscuit size lump of dough into a circle, put apple pie filling on one half, fold over, seal the edges with a fork, then fry in the frying pan. OMG I got to go back there! Regional food is a tough one. For my verrrry broad area, I suppose butter tarts would be one. And perhaps beaver tails. Neither would I serve as a breakfast starter. Maple danishes, perhaps. Regionality aside, I've been making date squares as the baked good on the sideboard fairly often this year and I'm amazed how well they go over. Loads of recipe requests. However, these aren't your grandma's date squares -- they've got slivered almonds and toffee bits in the crust and espresso powder in with the dates. Sweet scones, glazed lemon loaf and cherry torte are also very popular but not unique to my area. I enjoy making the danish from crescent roll dough (recipe on here somewhere). My guests always seem to like them. If I was braver, I'd try making cinnamon rolls, but I don't like any I've tried that use short cuts. It's mostly muffins that I bake in batches and thaw as needed. Thinking of recipes already posted here, I think I'll try more of those jello and yogurt jigglers this year. Sugar Bear convinced me to not use jello any longer! Go to my blog and look at the recipe section for 'panna cotta'. You can use food coloring/juice if you want colorful ones. Easy peasy. I made the danish from crescent rolls yesterday (with blueberries) and my guests still haven't stopped raving about it. It's a regular on my menu here. In the summer I use blackberries and/or blueberries from our property. Nothing new to anybody, but always a crowd pleaser, though if it's a starter they'd need to be smaller than Cinnabons. I saw a guy at the airport eating one. At first I said, Oh that looks good...then I saw him still eating it like a half hour later, and I figured I might pass him a tums on the plane after we took off!